The charming eco resort is located at an elevation of 1,700 meters (5,577 feet) in the Swiss Alps and features 7 km of ski slopes with private ski lifts. Guests are encouraged to explore the mountain through various types of winter adventures, including downhill skiing or snowboarding, cross-country skiing, snowshoeing, dog sledding, and guided hikes. The ski lifts are the only motorized systems, and the resort offsets their energy use by sourcing renewable energy. The resort is open in the summer as well, when guests can take advantage of warm weather eco activities, like hiking, mountain biking, climbing and more. 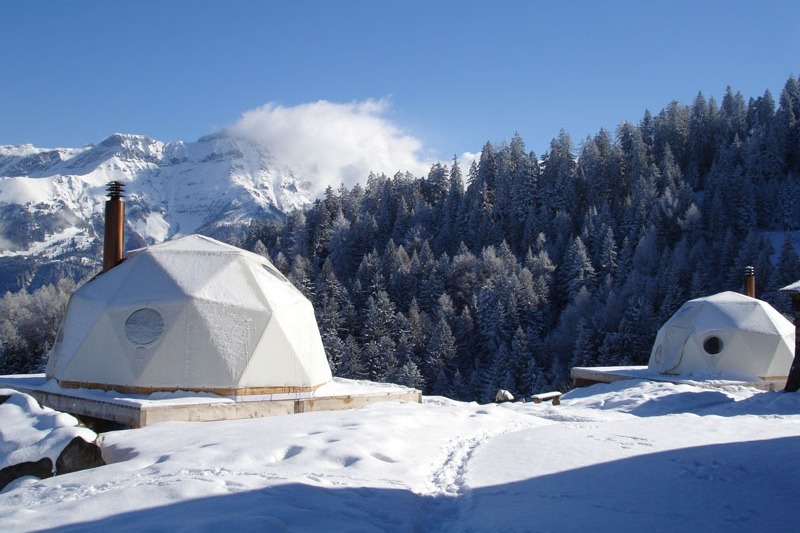 Guests can stay in the mountain lodge or they can rent one of the 15 white geodesic-dome pods with luxurious bedding and full service bathrooms. The pods, which are grouped around a common historic 1800’s wooden chalet, are anchored to wooden platforms and are heated with efficient little wood burning stoves. Platforms have a lighter environmental footprint on the pristine alpine environment than more permanent structures set on foundations. Located up and away from urban centers, the resort is free from urban pollution and enjoys a close connection to nature. Whitepod seeks to create, or recreate, a link of mutual respect between man and nature. Additionally, the resort limits its impact on the environment by minimizing its water and electricity usage, reducing waste production wherever possible, and utilizing renewable energy. The eco resort also aims to educate and raise their guests’ environmental awareness. The Whitepod eco resort was awarded the World Prize for Sustainable Tourism in 2005.
definitely a wicked project, but the pricing certainly puts it out of reach for many. I was in Switzerland this weekend and considered seeing about spending a night... until I saw the prices. It's more than a major five star hotel (which would normally have many things included). I'd certainly be interested in learning more about the domes and their supplier. With insulation being such a major part of heating/housing, I am very curious how a simple membrane structure could provide enough protection against the cold in mid-winter. As for photos of the chalet... there are a number of them on the site (as well as included in the article) - however the main areas are probably only the restaurant and the spa. OMG.....Some thoughtless person buried a Star Destroyer under the snow. I can't help but wonder why there are no photos of the indoor "facilities"... A major concern in a remote, cold resort like this. The charming eco resort is located at an elevation of 1,700 meters (5,577 feet) in the Swiss Alps and features 7 km of ski slopes with private ski lifts. Guests are encouraged to explore the mountain through various types of winter adventures, including downhill skiing or snowboarding, cross-country skiing, snowshoeing, dog sledding, and guided hikes. The 15 private pods are grouped around a 1800's wooden chalet, where guests can relax by the fire, eat meals and socialize. Guests can stay in dormitories in the mountain lodge or they can rent one of the 15 white geodesic dome pods with luxurious bedding and full-service bathrooms. The pods are anchored to wooden platforms and are heated with efficient little wood burning stoves. Platforms have a lighter environmental footprint on the pristine alpine environment than more permanent structures set on foundations. 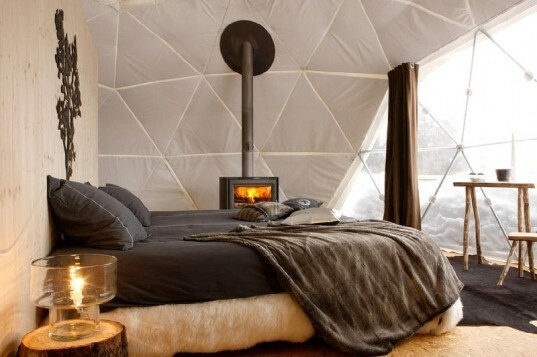 The geodesic dome tents are sturdy so they can withstand snow loads and they are heated by efficient little wood stoves. The chalet is a large airy historic building where guests can gather and socialize. A spa is also available for guests. The ski lifts are the only motorized systems, and the resort offsets their energy use by sourcing renewable energy. Located up and away from urban centers, the resort is free from urban pollution and enjoys a close connection to nature. Whitepod seeks to create, or recreate, a link of mutual respect between man and nature. Additionally, the resort limits its impact on the environment by minimizing its water and electricity usage, reducing waste production wherever possible, and energy. 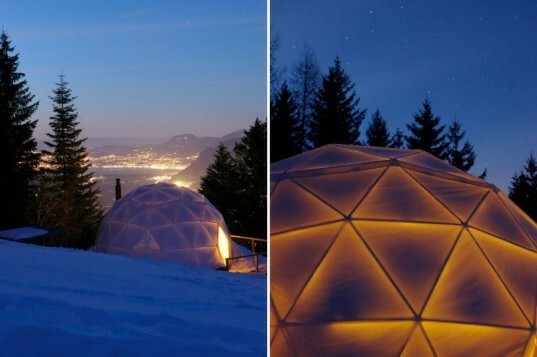 Whitepod seeks to create, or recreate, a link of mutual respect between man and nature. Additionally, the resort limits its impact on the environment by minimizing its water and electricity usage, reducing waste production wherever possible, and utilizing renewable energy. The eco resort also aims to educate and raise their guests' environmental awareness. The Whitepod eco resort was awarded the World Prize for Sustainable Tourism in 2005.